Taedyn was diagnosed with cancer in the beginning of March, 2011. She’s had surgery to remove the tumor, and chemo to eradicate what is left. It has been a week and a half since her second dose of chemo, and I noticed she was feeling slightly restless yesterday. This has not been unusual. She has been having diarrhoea on and off and so has been feeling somewhat upset. Her stomach has been grumbly and she’s had gas (both burping and farting) for weeks. I thought yesterday’s minor discomfort was merely related to the general intestinal discomfort she’s been having. This morning we went to an office for some contracting work, and she shortly became quite restless and would keep moving to lay down in a different spot. I finally put her in a down stay, which gets her to calm down when she merely needs something to focus on. She obeyed, but whined up a storm. I released her, and she wandered around some more, stopped, looked at me and whined. Seemed like the typical, “I have diarrhoea, let me out to poop!!" look, so I promptly took her out. She immediately had a loose stool, and I figured that had to be the problem. A few minutes after we both settled down, Taedyn started to retch. I ran over to put a trash can under her. She tried and tried, but could not produce anything. My co-worker and I thought she swallowed the vomit. I thought she would try to vomit again, so I sat with her, gently running my hands on her to try to sooth her. She retched again, and again did not produce anything – but this time she started to drop thick, clear drool right before retching. I laid her down on her side, and ran my hands gently down her body hoping that relaxing for a bit would help settle her digestive track. She then got up, and had a series of walking around, laying down, getting up, retching, licking lips, laying on her side, sitting up, head down, head up, and whining – basically, she just could not get comfortable. After she wretched a fourth time, I got her to calm down a bit and lay on her side again so I could run my hands down her body again. This time, however, her stomach visibly looked different than it had the previous time I had her lay down. It looked like it was slightly larger than it just was. I ran my hands over her stomach, and it just didn’t feel right. I’ve felt her stomach so many times grooming her and just petting her. On top of it, with the chemo and special diet, she has been losing A LOT of weight, so she generally has had a concave appearance, but now she seemed to be just starting to be convex. I immediately thought, “crap. She has bloat." My co-worker is also a dog owner so I asked him, “What’s the symptoms for bloat?" “I don’t remember." “Can you look it up? Like… right now?" All I remembered was that it was very serious and minutes mattered. He rattled off the symptoms and we both agreed it was very likely she had bloat. So… now I had to get to the vet! I had no car, so I asked my boss if he could drive us. He was busy, so I asked my co-worker – he took the train today! At that point I just called out to the office, “I need a car!" Another co-worker did have a car today, so we rushed out. I didn’t even pack up my stuff; I just grabbed my phone, wallet and leash and ran out the door! When we arrived, I told them I suspected she had bloat. He paged the triage nurse. I told her Taedyn has been having unproductive retching and a distended stomach, and she whisked her in the back. A few moments later she came back with a graven look, “Do we have your permission to do x-rays?" I nodded vigorously. They came back confirming it was bloat and that she needed surgery. They also said she was doing amazingly well, and everyone kept asking, “How did you know??" I put her in a down-stay at around 10:25 (I happened to look at the clock). I thought it was serious enough to ask my my partner to drive us home at 11:03 (he was busy). I checked Taedyn into the vet at 11:30. I walked out of the vets at 12:10. All in all, very fast. She’s out of surgery and doing great. Her stomach had twisted and they put it back and pined it. There was no damage to any of her organs. Taedyn is very fortunate that I was able to figure it out and save her a lot of pain! She’s also fortunate that I have a “for emergency use only" credit card because the surgery cost $4k! 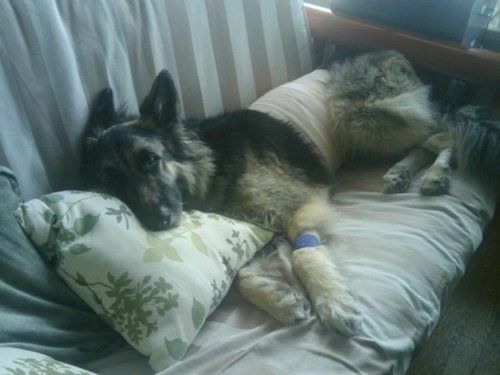 She’s staying overnight, but everything points to her having a full recovery. I’ve been reading stories of other dogs that have bloat, and its been scary how many have gotten into surgery and died on the operating table. This was originally written May 10, 2011, and has been shared in multiple locations.